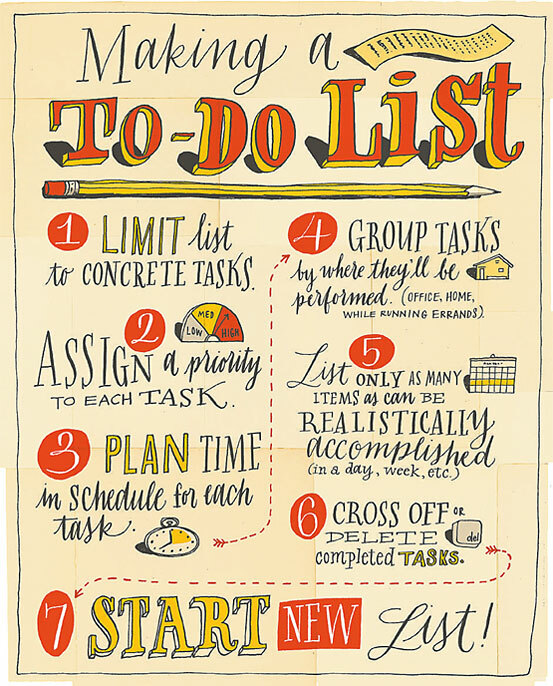 The first item on a highly successful to-do list: Make a better to-do list. With the new year comes the urge to accomplish all the things that were meant to be done the year before, and it often starts with long to-do lists. The lists themselves can fuel anxiety, says Sasha Cagen, an Oakland, Calif., life coach and author of a book on to-do lists. She sees many new clients at this time of year and often advises them to put more tasks on their list that they genuinely enjoy. Some 23% of list-makers spend more time making the lists than doing the tasks on them, according to a 2006 online survey of 600 people conducted by Ms. Cagen. There are, of course, all kinds of ways to stay on top of tasks. 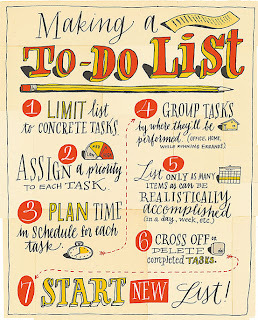 Some people like the tactile experience of hand written to-do lists on paper, embellished with doodles or designs. Others think more clearly when they type, sort and store tasks in computers, tablets or smartphones, and they like the mobility of programs that update lists on all their devices. Even with so many methods, it is still easy to muck up list making. Kat Nagel, a technical-communications consultant in Rochester, N.Y., used to let her to-do list balloon to 14 pages and "it was never up-to-date," once causing her to miss a project deadline. Ran Barton, an operations analyst in Wilmington, Del., wrote his to-dos on pieces of paper—which he sometimes lost. Kim Bauer's long paper lists of all the tasks and goals she hopes to accomplish sometimes "get completely out of hand," says the Vancouver, Wash., writer. Rewriting and prioritizing them becomes an excuse to procrastinate. Now, she forces herself to condense them into a single, more realistic list, and it "makes me feel more organized." Kris Paige, a veterinary technician, used to keep her to-dos on sticky notes, "but the glue failed," she says. She started writing up to 20 tasks on her bathroom mirror in dry-erase marker so she would be sure to see them, but the method sometimes caused embarrassment when she forgot to erase the list before visitors arrived. Using a digital app to enter tasks in her phone and computer reduced the mirror list to two items, says Ms. Paige, who owns a Livermore, Colo., llama ranch. A well-maintained list is "an essential tool for staying grounded, for saving your energy and for doing things rather than trying to remember what to do," says Julie Morgenstern, a New York author and expert on time management. Effective to-do lists are limited to specific tasks that can be tackled right away and finished fairly soon, Ms. Morgenstern says. Instead of listing "solve client issue," write, "spend one hour defining the scope of client problem." A list should reflect a time estimate needed for each task. And it should be integrated into a calendar or schedule, to avoid "planning 17 things for tomorrow which, if you added them up, are going to take 20 hours," Ms. Morgenstern says. 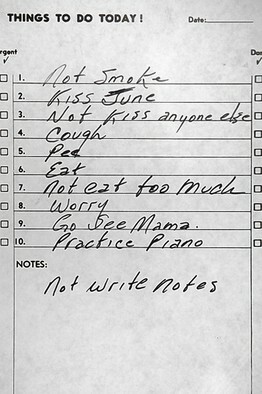 A hand written to-do list by Johnny Cash, who died in 2003, was sold for $6,400 by Julien's Auctions in Beverly Hills, Calif., last year. There are strategies for tackling dreaded tasks as well. Ms. Morgenstern tells of a computer consultant who was energized by appointments with clients, but stalled with administrative tasks like paying bills, writing proposals or planning strategy. She suggested he assign start and end times to mundane tasks as if they were appointments, and break them up with activities requiring contact with people. The new approach stopped his procrastinating. To prevent getting mired in mindless make-work, some software helps people measure tasks against broad life goals. Ms. Nagel, the Rochester consultant, uses Life Balance by Llamagraphics. The software has her start with a master list of goals, such as doing fulfilling and financially rewarding work and volunteering for community causes. These are prioritized and broken into tasks, with details about the time and effort required and where and when they must be done. Using this data, the app assigns eight to 12 items to Ms. Nagel's to-do list. She hasn't missed a deadline since she starting using the software, which has helped her shift plans to balance work demands, singing in a choir and volunteering at a food bank. For years, Nathan Harling avoided making to-do lists. He took pride in remembering everything instead. The turning point came a few years ago when he realized "I had 3½-weeks of work and two weeks to do it," says the Mountain View, Calif., videogame designer. "I felt so overwhelmed by the stress of what needed to be done, that I couldn't remember what needed to be done." Mr. Barton, the operations analyst, now uses an app called Remember the Milk on his iPad, smartphone and computer. It enables him to sort and prioritize tasks and set reminders of due dates and repeating work, financial and home duties for the father of three. 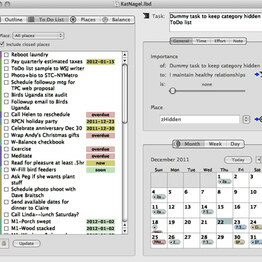 The app can post and share tasks on email and online calendars. 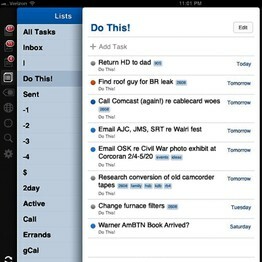 It also stores notes and data on items and calls up "smart lists" of all tasks involving a "bill" or a "call." His first to-do list, scrawled on the back of an envelope, ended with, "try not to go crazy." The list helped him power through work, and he has been making lists as needed ever since. The app lets users like Ran Barton of Wilmington, Del., write notes to himself. He uses it to sort and prioritize tasks, as well as store data covering work, financial and home responsibilities. Software set-up involves listing broad goals, such as 'spend time with family.' Then, users like Kat Nagel of Rochester, N.Y., whose list is shown above, can prioritize and sort tasks to balance work and home. 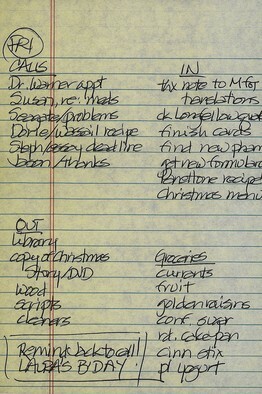 Kim Bauer learned to condense long, hand-written lists into a single page like her list shown here.